Pebble Creek at Lake Mary offers one-, two-, and three-bedroom floor plans in traditional and townhome layouts. Open floor plans allow for easy flow between spaces. 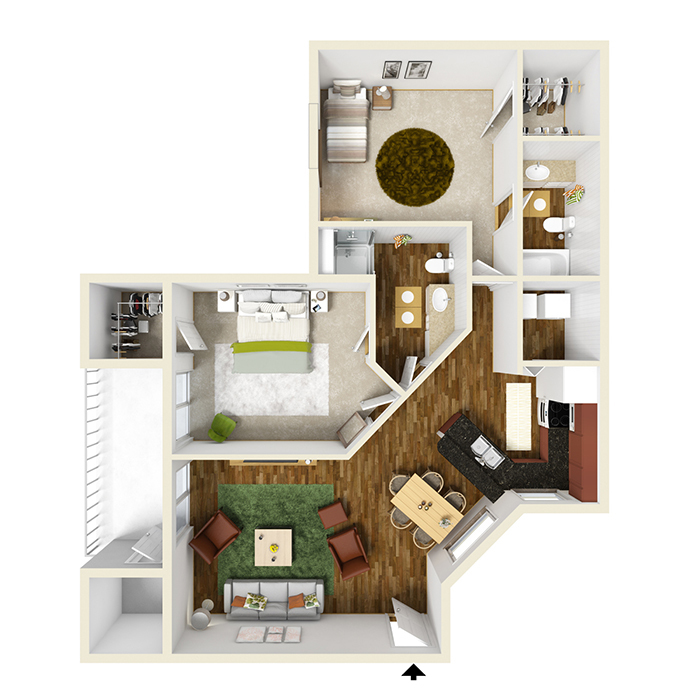 With large kitchens and a screened-in patio or balcony, apartments at Pebble Creek at Lake Mary have been designed with your comfort as a top priority. At 754 square feet, this one-bedroom, one-bath apartment provides ample living space. The open kitchen features a breakfast bar and overlooks the living and dining area. A utility room is located off the kitchen. The bedroom and the living room both have sliding glass doors to the large screened-in balcony or patio, which features a storage closet. The bedroom includes a walk-in closet and private bath access. This apartment starts from $1045. This one-bedroom apartment includes a den that could also be used as a formal dining room, a study, or a home office. The open living room features sliding glass doors that lead out to the screened-in patio, which includes a storage closet. The kitchen has a breakfast bar and overlooks the living area. The spacious bedroom has a walk-in closet and private access to the bathroom. 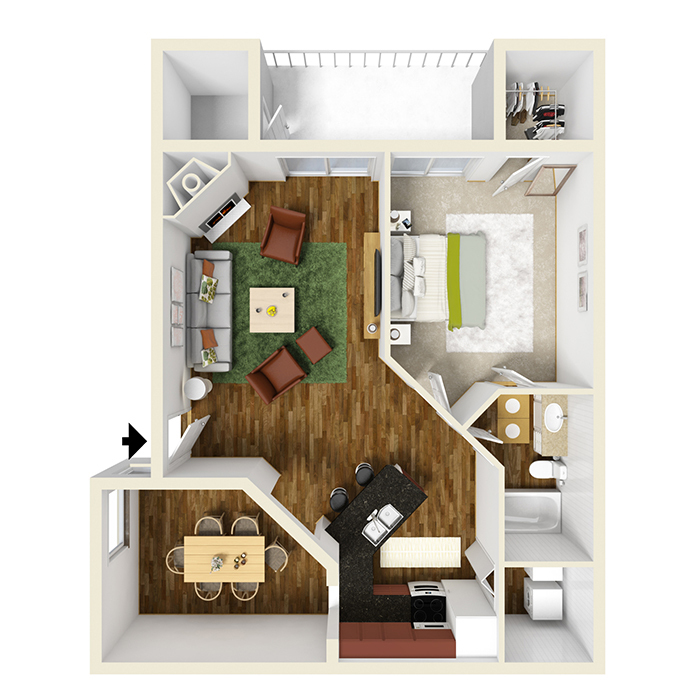 This floor plan has 872 square feet of living space and rents from $1,125. This is a two-bedroom, two-bath apartment with 1,033 square feet of living space. This apartment features a large living and dining area open to the kitchen, which includes a breakfast bar. The master bedroom has an en suite bath and a walk-in closet. The second bedroom has private bath access, a walk-in closet, and sliding glass doors to the screened-in patio/balcony. Rent this apartment, starting from $1,300. 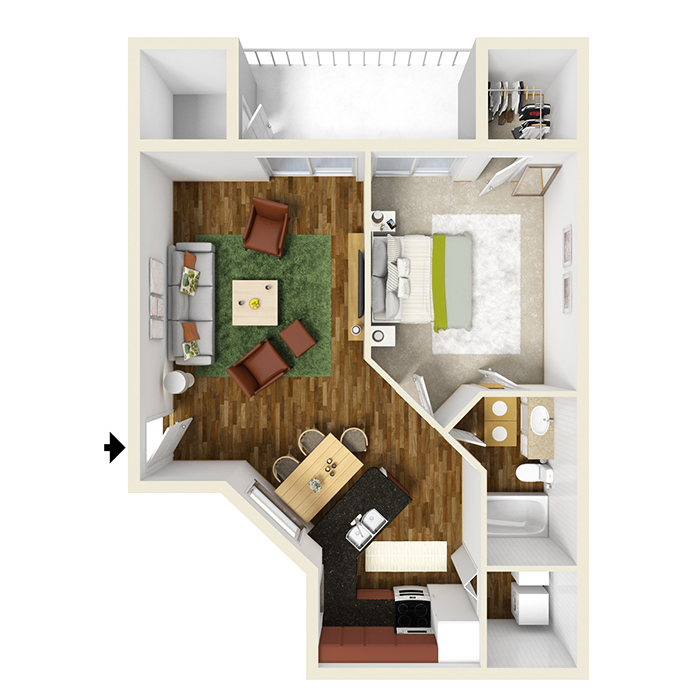 This two-bedroom, two-bath apartment with den has 1,150 square feet of living space. The bonus den is located off the living room. The kitchen includes a breakfast bar and access to the utility room. The master bedroom is located in the back of the apartment and features a walk-in closet and en suite bath. The guest bedroom has private access to the guest bath and a walk-in closet. The guest bedroom and the living room have sliding glass doors to the screened-in patio/balcony. This apartment starts at $1,450. Pebble Creek at Lake Mary’s townhome has 1,160 square feet of living space. 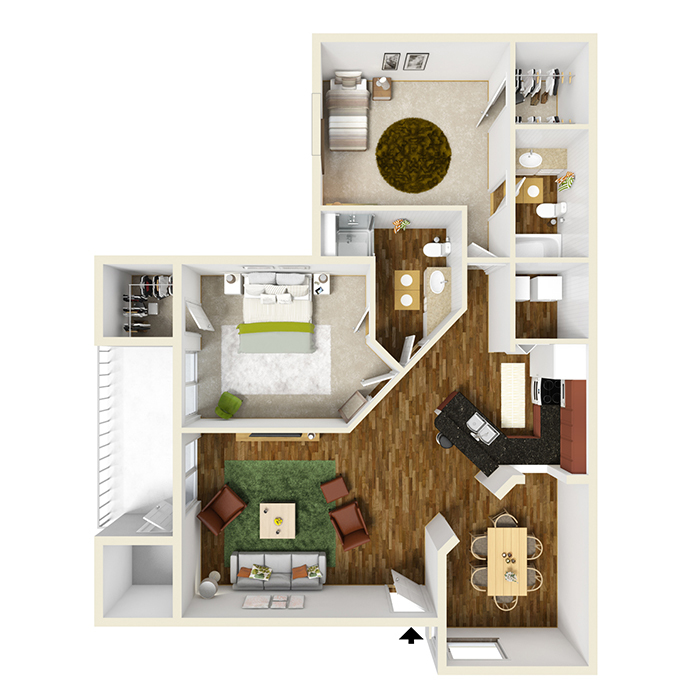 This two-bedroom, two bath floor plan is a split plan with the master on the second floor. 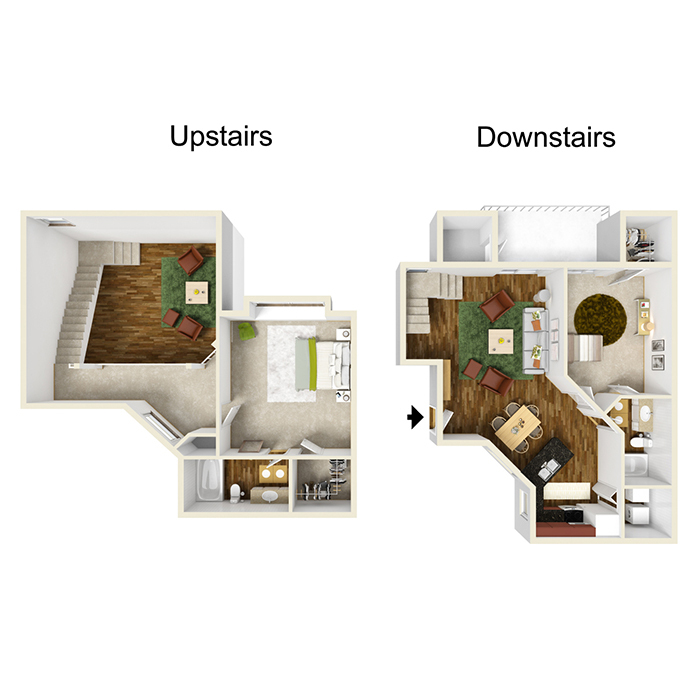 The lower level includes the living and dining area, the kitchen with breakfast bar, a utility closet, and a large bedroom with walk-in closet and private bath access. The living room and bedroom have sliding glass doors to the screened-in balcony. The upper level is open to below and features the master bedroom with en suite bath and a walk-in closet. This floor plan is priced from $1,450. 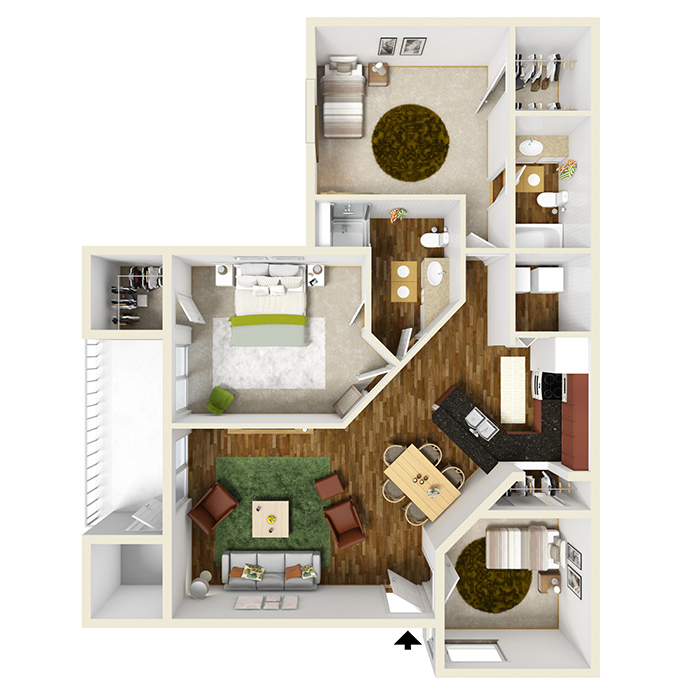 This spacious three-bedroom, two-bath apartment has 1,150 square feet of living space. It has a large living and dining area, a kitchen with breakfast bar and access to the utility room, and a spacious patio/balcony with storage closet. The master suite has a walk-in closet and private bathroom. The second bedroom has access to the screened-in patio/balcony, a walk-in closet, and private bath access. The third bedroom is in the front of the apartment and includes a large closet. This apartment starts at $1,600.